As the saying goes, where there is a market, there will be competition definitely. Despite Apple's iPad has dominated the tablet market since its first release, there still are many other excellent tablet computers springing up daily. A case in point is Kindle Fire HD, a brand-new Android tablet made by Amazon. With comparative low price, Kindle Fire HD has been attractive since its launch, becoming the strong rival to iPad, Galaxy Tab, etc. Its 7-inch multi-point touch screen, 1280-by-800-pixel display resolution, 11 hours long battery life and at least 16 GB storage make it quite appealing for watching movies and TV shows. If you have purchased many DVD discs and want to make the utmost of the Kindle Fire HD, it wouldn't be better to watch the DVD movies on Kindle Fire HD, especially when you are on a boring trip. However, you may quickly get frustrated to import DVD to Kindle Fire HD since Kindle Fire HD only supports H.264, MPEG4 and VP8 video formats, worse still, does not have the DVD player. How to watch movies on it then? Don't worry. This is not a big deal. Your plight can be easily solved by a professional DVD converter for Kindle Fire HD, helping you convert DVD to Kindle Fire compatible format. As for the DVD converter for Kindle Fire, MacX DVD Ripper Pro is highly recommended. Just through a few clicks, it can smoothly rip new movie DVD releases (including HD DVDs) to Kindle Fire HD friendly video format with high image quality. Another feature of this program is worth mentioning. As we know, newly published DVDs are always encrypted with DVD copy protection, making many common DVD rippers fail when ripping these protected DVDs. But for the mighty DVD ripper for Kindle Fire HD, ripping such encrypted DVDs is just a piece of cake, letting you rip DVDs to Kindle Fire HD 6/7/8/10 without any obstacles. Insert the DVD disc into the disc drive of a Mac computer, click the "DVD Disc" button to import it to the DVD to Kindle Fire HD ripper. Since you need to rip DVD to Kindle Fire HD, choose "to Amazon Video-Kindle Fire HD 7 inch (H.264 or MPEG4 preferably)" button as the output format. Optionally, before converting, you can edit the DVD videos using the buttons "Trim", "Crop & Expand" to made individual video. Tips: If you just want to copy the new movies on DVD to your computer for digital storage and protection, instead of converting to other portable device, the "Copy" feature of this program lets you backup your DVD collection with original video quality and original 5.1 channels Dolby AC3/DTS audio. After finishing the above steps, click the "RUN" button to start to rip copy protected DVD to Kindle Fire HD 6/7/8/10. All the tasks will be finished in a short time, and then you can watch your favorite DVD movies on Kindle Fire HD 6/7/8/10 freely on the move. Besides, if you want to play the ripped DVD content on iPhone iPad iPod, you can rely on MacX MediaTrans to easily transfer the converted video to iDevices for playback on the go. Notice: We only advocate using this best DVD ripper to rip commercial DVDs to Kindle Fire HD under the concept of Fair Use and do not encourage any illegal reproduction or distribution of copyrighted content. Please abide by the local DVD copyright law before doing it. How to rip DVD to Google new Nexus 7 compatible videos to put and watch DVD movies on new Nexus 7 tablet? Download MacX DVD Ripper Pro to accomplish this task in a few mouse clicks. 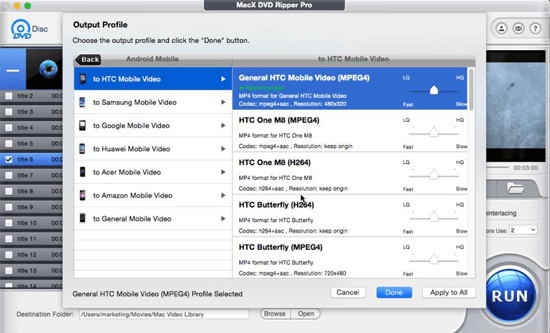 MacX DVD Ripper Pro is the best DVD to Kindle Fire HD ripper which can freely rip DVD to MP4, MOV, M4V Kindle Fire HD supported formats or iPad Pro/Air 2/mini 4 and backup any DVD disc, ISO image, DVD folder on Mac (MacBook Air/Pro, iMac etc) in 1:1 quality with original quality.